_Q. Why start/join a commuter vanpool? A. By sharing commuting expenses with others, your personal out-of-pocket costs are greatly reduced. Putting less miles (wear and tear) on your vehicle, you save on maintenance, depreciation and insurance costs. And statistically, vanpooling is the safest mode of commuting. A-2. vanpooling is considered a form of public transportation and presently up to $265/month of expenses can be paid in pre-tax dollars. See your HR department, personal tax consultant or click here for more information. Q. How do I start a vanpool group? Q. How do I join a vanpool? A. By clicking on the EXISTING VANPOOLS page, you can search for groups/routes already established. Please Note: because this is a new program, there will not be a large selection of existing vanpools. If there are no routes matching your needs, click on the CONTACT US page, provide the information requested and Commute with Enterprise will match you with others to form a group or notify you when a group forms matching your needs. Q. How much does it cost to vanpool? A. In general, you can count on saving about 80-85% over driving your own car to work. leases are determined by the monthly commute miles of the vanpool and the size/configuration of the van. Your representative can calculate total monthly costs and individual out-of-pocket expense estimates and provide a personalized quote on request (see CONTACT​ US page for details on receiving a "monthly out-of-pocket" quote) In other words, vanpooling costs less than gas alone for your own vehicle. When you include your savings on service/maintenance, depreciation and insurance (your true commuting costs) annual savings are significant. Q. What if I'm in a vanpool and I have a personal emergency? A. 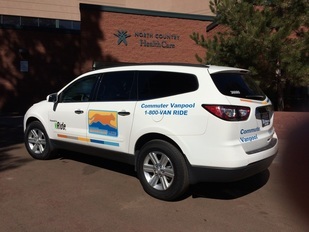 The NAIPTA program includes emergency ride home program for the vanpool for after hours emergencies and there are "non commuting/personal" miles allowed each month for all participants who are authorized to drive the van. Q. What if we start a group and for some reason we need to terminate the vanpool? A. The lease agreements for the vans are for 30 days. If the group needs to dismantle for any reason, no one is saddled with any extenuating financial commitment. A. Click on the CONTACT US page to request specific information.